In response to the many requests I get for resources, please find beneath a short list of some resources. I will gladly update this if you have a name or company that has done great work for you. Just because a company's advertising says 'restoration' does not mean they know what they are doing. If you want a really authentic window/floor/ porch, there are a lot of companies that want to charge loads of money for really bad work. Those listed here have done really excellent actual restoration work. With people travelling to Europe and seeing 400 and 500 year old homes, they are more inclined to restore rather than renovate. The good restoration people I know are really busy. But they can be scheduled in. Winner of a great many awards, Paradigm Shift restores windows, doors, and architectural detailing. There may be people as good, but no one is better. Drew Skuce is taking a break but we hope he will be back soon.. Historic lumber in Acton Ontario is the home - or possibly the nursery - for literally acres of historic flooring, staircase parts, joists etc. See the historic lumber section under materials. As well, these guys know how to install the floors without butchering them and cutting them into small bits like some other companies do. The historic lumber website has loads of good information. If you are looking to buy enough flooring to do an entire house - matching - and people who know how to do it properly, this is the best place to go. In this photo is the floor in their retail space as well as a cupboard and table and hutch all made from reclaimed lumber. If you are restoring an older home, the flooring is a crucial part of the building. "Wide-plank" flooring is a selling feature in most houses. At Historic Lumber they have all the different sizes plus the know-how on how to get it back together. The floor in the restial space of this establishment shows the character of the original floor plus a really nice, lustrous finish. The furniture in the back ground is made of reclaimed lumber. The table, cupboard and hutch have all been produced from floorboards and larter boards rescued from tear-downs. The paint used on the furniture is milk paint from Homestead milk paint in Toronto. Hal Cooper is a perfectionist who likes to buy homes, restore them, and then move on to the next. He does work on other buildings and does an incredible job. The Ionic columns on the right were, frankly, a mess when he got them. In the area west of Tornonto Jamie Stowe does great work.The before and after shots on his website show you what can be done with woodwork that has been left to rot. In order to get good finishes, you need to have someone who actually does good carpentry to set up the frame. Aaron Pierce is honest, hard working and dependable. He is sensitive to historic properties and understands how they go together. He could also oversee a restoration project with no problem. In the area west of Toronto Steve Calverley does great work. He is enthusiastic about restoration, especially Arts and Crafts. Alex Towers does really nice finish carpentry. He is not yet trained in restoration, but does good work. Older homes generally had fireplaces and often they were Rumfords. Bree Blaker of Blaker Custom Masonry can build authentic Rumford fireplaces. he can also do cutting edge new designs or rustic stone designs. He lives in Prince Edward County but travels around a lot doing work around Ontario. Colin Coveny seems very knowledgeable and clearly does great work. I have never worked with him but from the phone conversation and the website I would say he's a good bet. Chris is just starting out but does good honest work. There are loads of great places to get architectural materials and artefacts. Many of these places are in the country and a good destination for a Sunday drive. Below are some of the materials locations. If you want wide plank flooring, baseboards, doors, etc., Historic Lumber in Acton is a good place to start. They have many widths of flooring and a few different materials. They also have baseboard etc. in reasonable lengths and quantities. Specialising in wide plank flooring, Northern Wide Planks in Schomberg ON will supply you with various grades of wide flooring. They can finish it in a variety of finishes from very smooth to original where all the saw marks etc. are visible. If you are restoring an old home, often there is original flooring under the linoleum etc. If you are lucky, this can be restored quite easily. If some or all of the original floor has been destroyed, to regain the 'spirit' of an old building, wide plank floors are really necessary. This photo of the Nelles House in Grimsby shows the wide plank flooring, 12 to 16 feet long, found in a Georgian style house. The hearth would be very plain with no decorative border. Also supplying flooring are the three locations of Timeless Materials and Legacy in Cobourg. These suppliers also supply doors, doorknobs, lighting fixtures and other architectural artefacts. Here is an 1830s floor made of pine. The boards are 9" wide and eight to sixteen feet long. Note the simple hearth treatment. Like flooring, historic baseboards will take some time. They need to be stripped and then finished. Once down to the wood, if you use milk paint or linseed paint, you will never need to finish them again. Doorknobs and hardware make a huge difference in a restoration. You can get them all to match, and they can all work. Yes, it is not always easy, but then again, for every 10 doorknobs you buy at a box store, one of them needs to be returned because they are so cheap and simply do not work. Historic Lumber, Legacy, Timeless Materials all have hardware. The king of hardware, however, is Jan Kamermans. If you want an entire house or building with hardware that matches, he's the guy. If you want a specific piece of hardware to match, he's got it. He also has a wide variety of lights and other goodies. Getting all the locks to work and matching them is also a bit of an art. Jan will do all of that. He has the know how and the equipment to restore all the hardware to fit the building or environment. What Historicc Lumber is to wood, Jan Kamermans is to hardware. The Kamermans shop in Hamilton is like walking into the Olde Curiosity Shop. It is by appointment only, but a real treat if you can get there. Historic Lumber in Acton has a lot of hardware, particularly door knobs. Timeless Materials has a shop just outside of Waterloo. Artefacts in St. Jacobs, less than an hour from Historic Lumber, also has a good variety of hardware. About an hour west of St. Jacobs and Waterloo is Lucan, another good spot. Legacy in Cobourg has a wide variety of doorknobs and hardware as well. They ship a lot over the internet. If you are going to Cobourg, go a little further to Balleycanoe just east of Kingston for a nice variety of artefacts largely from the east of the province. Heading towards Georgian Bay there is a great spot in Duntrun, just south of Collingwood. Then head west to Southhampton to see another Timeless Materials. In Toronto are three excellent architectural artefact suppliers. This corbel, taken from a Second Empire or Italianate building, was painted in 1890 or so. It stayed on the building until it was demolished about 3 years ago. Allan at Historic Lumber rubbed it down with Linseed oil, and it's good for another 100 years. Yes old buildings take a lot of upkeep if you use the wrong materials, but if you use the right ones, there is only maintenance every 100 years or so. Milk Paint can be used on interior or exterior wood. 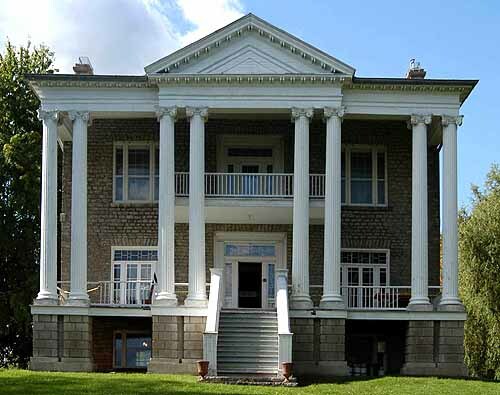 Buildings that have exterior milk paint are usually covered with a coat of oil - Fleming College's restoration program uses Hemp oil to finish. Milk paint stands the test of time and is chemical and solvent free. Here is a door that has been partly restored. On the left are crumbling layers of oil and acrylic paint. The green paint that is still adhering to the wood is milk paint. Both milk paint and linseed paint penetrate the wood and become part of the finish. Often milk paint is covered with a layer of oil for exterior use. If your paint is needing a bit of an uplift, a rubbing with boiled linseed oil will restore it to its original lustre. It is true that old doors take some time and some expertise. It is also true that they are heavier and last longer than new doors. The styles are also unique and charming. In Britian and norther France they often have a velvet ot tapestry curtain that can be drawn across the door during the really cold winter. This allows for an R value of about 10 on top of the R value of the door. Make sure it is properly sealed and it is just as good as a new one. There are a lot of graduates coming out of Willowbank that have expertise in putting together a team to do a full restoration. Megan Hobson is a good person to contact with regard to management. It's quite a small field, and most people know one another. If you want drawings done for a new porch or a restoration, Craig Sims is a good choice. He Knows his subject very well and is extremely talented. Community Colleges are starting to have very good programs for restoration. Algonquin College has a wonderful Historic masonry Program, and Fleming College has a good restoration and environmentally sensitive building program. Part Time programs are available through various sources. Edifice magazine is a legendary source of Old Home information. Tutorials and sound advice can be obtained from this source regularly. This 1780s window was almost unrecoverable. Now it is a focal point in the building. The original glass was recovered and used. Drew Skuce will teach you how to do this kind of restoration. This utterly gorgeous building is now used for a wide variety of classes from full time programs to part time training sessions. 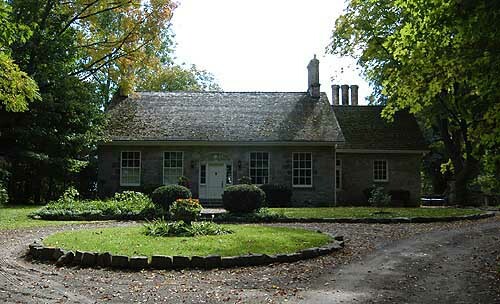 Located in Queenston, it is the perfect location to see excellent older buildings. Chris Cooper and the Cooper Guild are legends in Old Home restoration in Ontario. The magazine has been providing great information about products, artisans and restoration techniques for years. Chris Cooper sponsors a variety of hands-on workshops. Learn how to repoint stone and brick, restore artefacts, and recreate wonderful architecture. Angu, Margaret.The Old Stones of Kingston. Toronto: University of Toronto Press, 1966. Atkinson, Dan. ed.A Decade of Sundays, Quinte Walking Tours. Belleville: volume 1, Architectural Conservancy of Ontario, 1994. This is a free, nonprofit website. If you have found it useful and would like to contribute to its continued success, your donation can be securely accepted through PayPal below.